Autumn is my favorite time of year! The air has a quality unlike any other time. It’s sweet, but not the young sweet of spring. It’s drier, but not a harsh dry like the end of summer. There’s a chill, but not the gelid air of winter. It’s a bit of perfection squeezed between two vastly different seasons. Plus, Halloween happens in autumn. 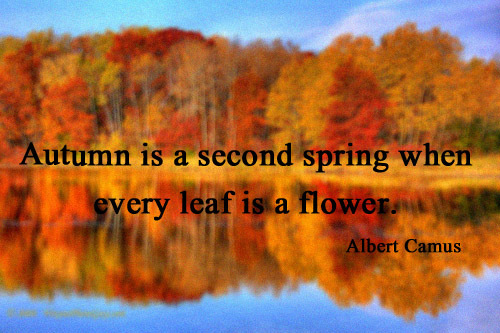 Today’s quote celebrates the beauty of this magical time of year. I completely agree! I love fall (I also love spring because I’m a garden junky) but fall can be so beautiful! With all the reds and oranges and yellows. The warm, spicy apple cider bubbling on the stove. The oh so soft sweaters pulled out of winter storage, like seeing old friends after a long absence. Each one feels like a hug from my grandma (the best knitter on the planet). There are so many reasons why fall is wonderful!